Does your AHU text you an alarm condition? You check your email on your smartphone, get your bank balance, read text messages and watch videos. But does your chiller send you email when it needs maintenance? Does your AHU text you an alarm condition? Can you see access logs or a live video feed at a critical entrance? If these two reasons have been holding you back from direct communication with your building automation systems, take a look at groov from Opto 22. With this product you can build operator interfaces for your building systems and securely use them on virtually any device with a modern web browser: computer, tablet, or smartphone, regardless of size or manufacturer. A building engineer can monitor status and initiate an override from his iPhone. A repair contractor can check his Android tablet to see which compressor is running inefficiently. A building manager can track energy usage and see cost savings on his desktop computer. 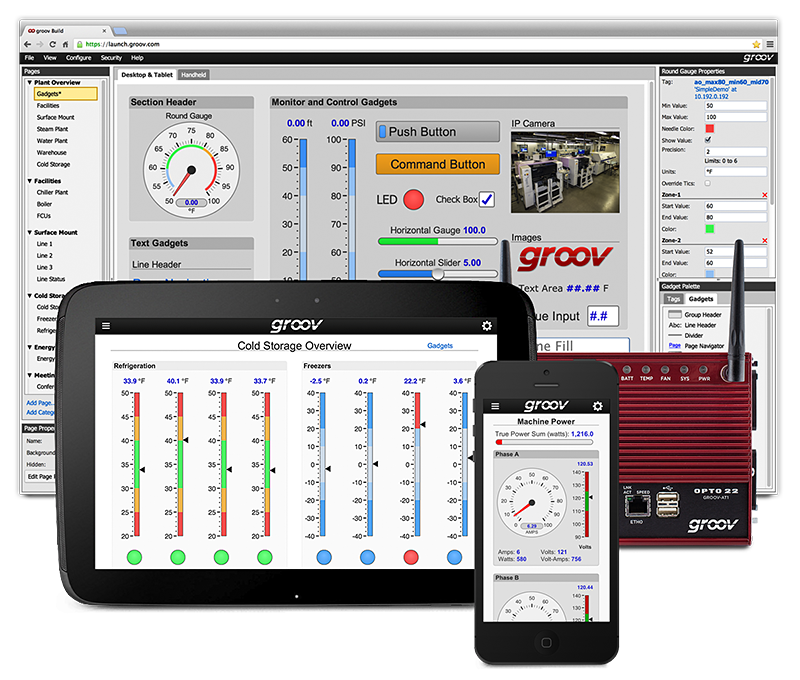 Using groov you develop an interface once, and it can be used on virtually anything. The operator had to have the device that worked with the interface. Juggling two phones—your own plus one for business—was no fun. If you needed more data or more capabilities, it was difficult to get the interface updated. groov changes all that. Development is simple because it includes everything needed to build and view operator interfaces. There’s no server to set up, no software to install, and no plugins. Whether you’re developing the interface or using it, all you need is a modern web browser, like Firefox or Chrome. To develop an interface, you drag and drop touchscreen-ready gadgets from a built-in library. Then you tag each gadget as a data input or a control for an output. These inputs and outputs already exist as part of your control program. The interface you build adjusts to work on multiple devices. Its responsive design means that gadgets, labels, text, video, and images all scale to match the size and shape of the phone, tablet, or computer the user has, without becoming too small to manipulate or read. All browser interaction with groov is protected by secure sockets layer (SSL), the current standard for encrypting data that’s passed over the Internet. SSL is what your bank uses. When you build your interface, you also decide who has permission to use it. You set usernames and passwords and decide which screens each user or group of users can see. Other security options are available, like separating your control network from the network that connects to the Internet. In addition, Opto 22 recommends using a VPN (virtual private network) to monitor and control your system remotely. groov is available now from Opto 22. 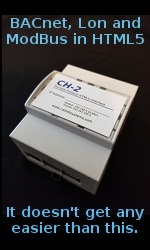 At present it works directly with multi-protocol Opto 22 SNAP PAC controllers and OptoEMU Sensor energy management units. A later release will include OPC UA, so you can build operator interfaces for any system that talks OPC UA. Opto 22 provides free product support, and all their products are manufactured and supported in the U.S.A. For more information about groov, visit groov.com or contact an Opto 22 engineer.